Bear with me here as I show you perhaps the nerdiest science experiment you’ll ever see. 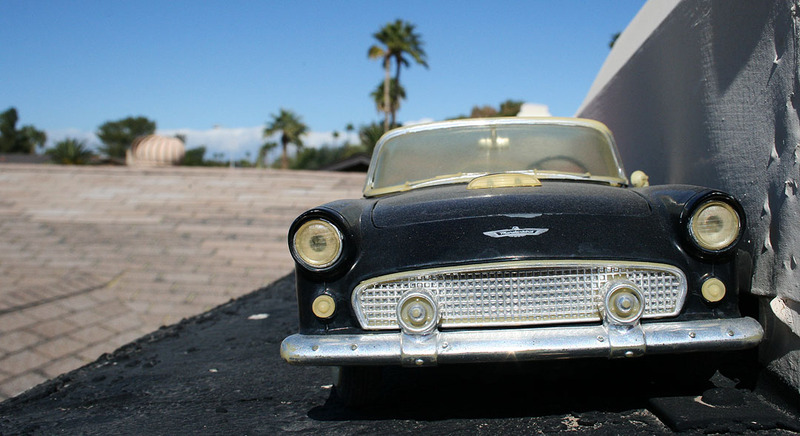 For the last few years, I’ve had some die cast 1:18 scale model cars on my rooftop. Neighbors have commented on them. Visitors spot them from the driveway frequently. But there is a reason for all this. It’s a durability test. 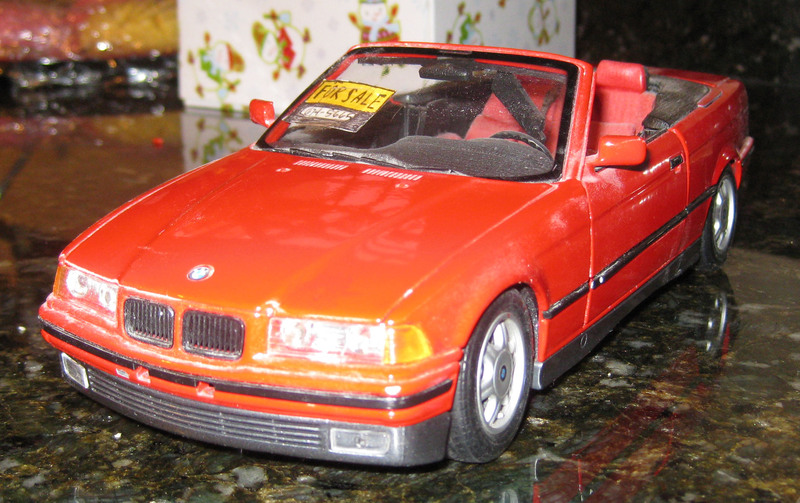 Many years ago, a Saturday closet-cleaning activity left with me a box full of 1:18 scale die cast model cars that I needed to get rid of. I’d had some of them for many years. 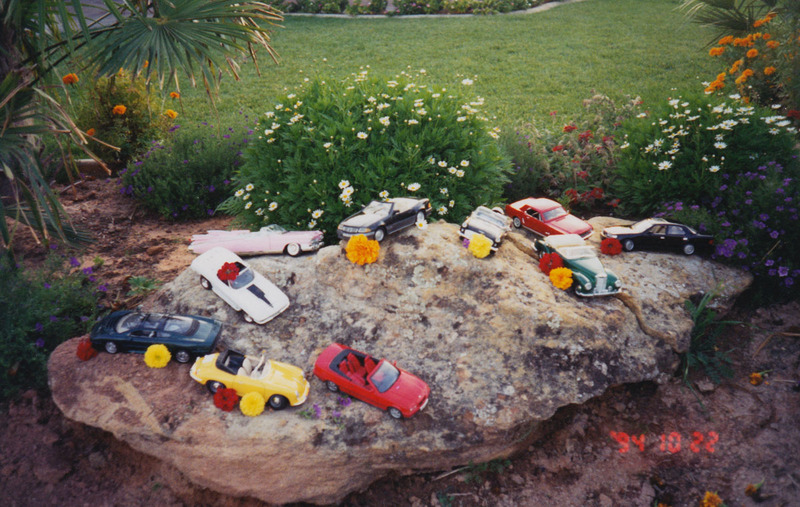 Here are photos from 1994 with the cars neatly displayed (with flowers from mom’s planter!). 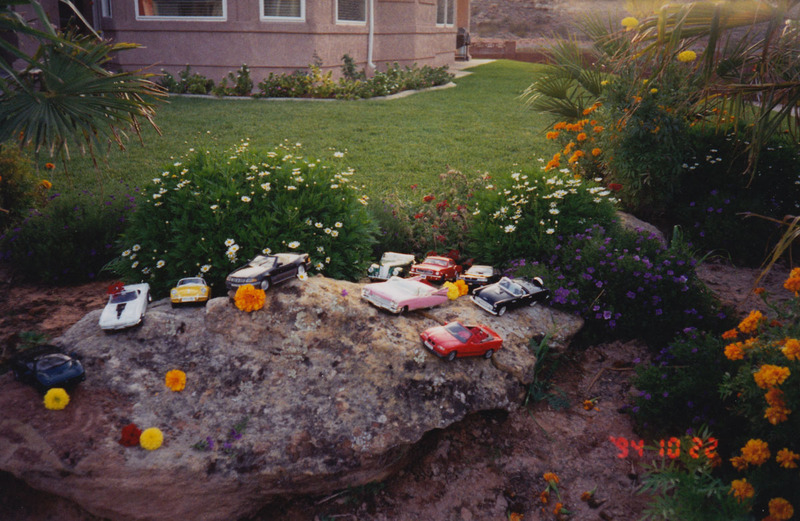 The thought crossed my mind that I could put these model cars to a test much like I’ve time-tested cars of the life-size variety. 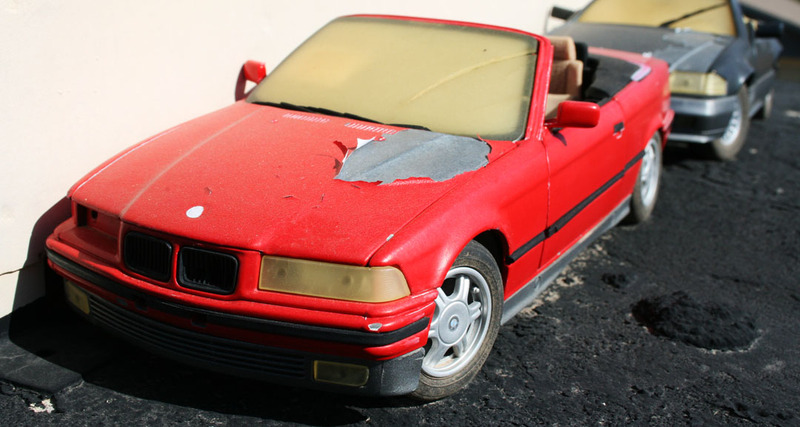 Would the harsh Arizona climate take its toll on a model car in the same way it does to regular cars? There was only one way to find out. I climbed up a ladder and put the cars on my rooftop, surrounding the chimney on a platform that would shield them from the wind. 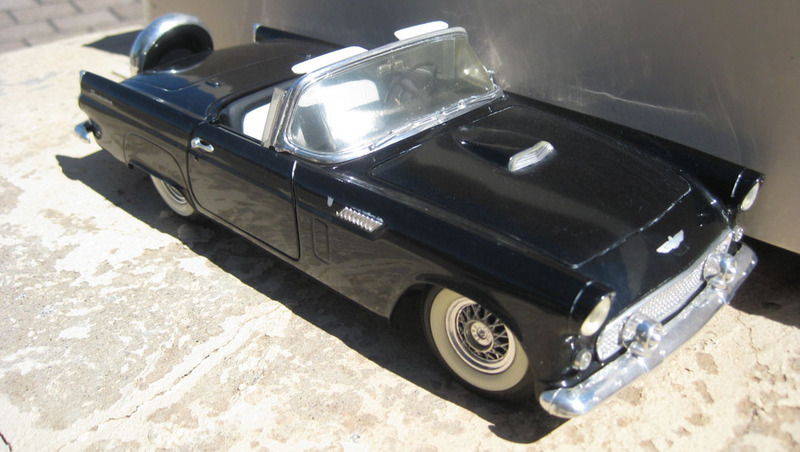 The launch date for my durability evaluation program was just over 4 years ago, in December 2009, with just the BMW 3-series and the Ford Thunderbird. About 6 months later, I added 4 more vehicles to the fleet and all 6 cars have been under periodic analysis ever since. Every few months, I scale my ladder and take photos of the current status of each of the cars. 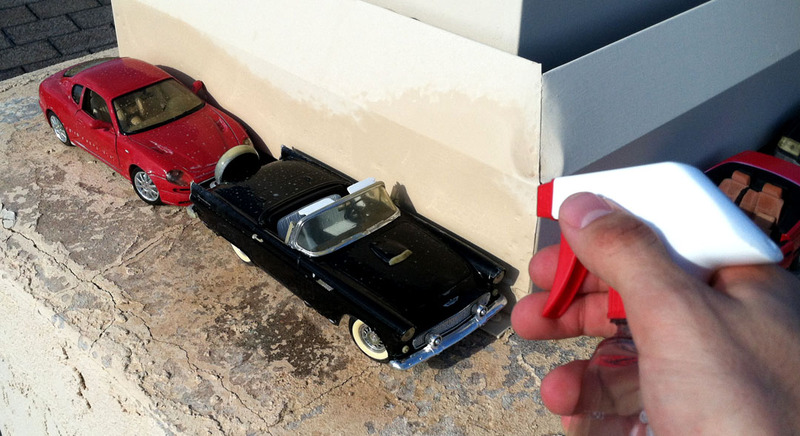 In August 2012, I sprayed all the cars with a heavily concentrated saltwater solution to hasten the corrosion process. The results were readily evident when I checked on the cars a month later. Otherwise, the process has been completely natural with weather conditions in Phoenix, ranging from freezing temperatures all the way up to temperatures in the low 120’s Fahrenheit. I have made no effort to clean the vehicles after our desert rain and dust storms. I did paint the driveway surface black to simulate blacktop. 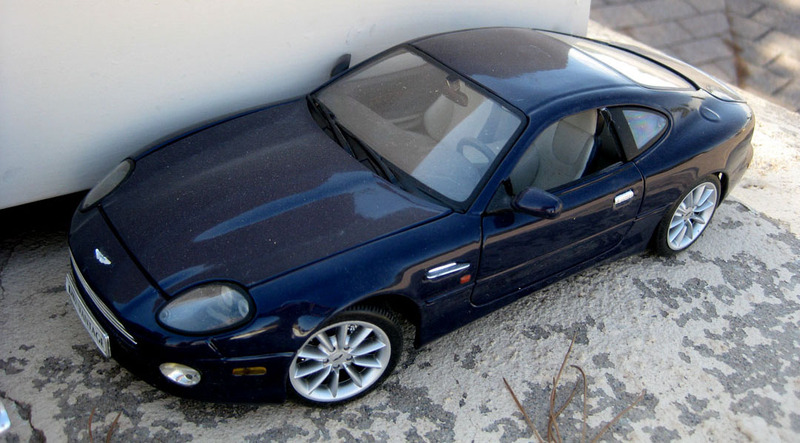 DB7: Definitely the best paint here, the Blue Sapphire finish still looks presentable. However, this car has also had the most access to shade. Aside from some discoloration of the windows & plastic trim, it has weathered the storms very well. 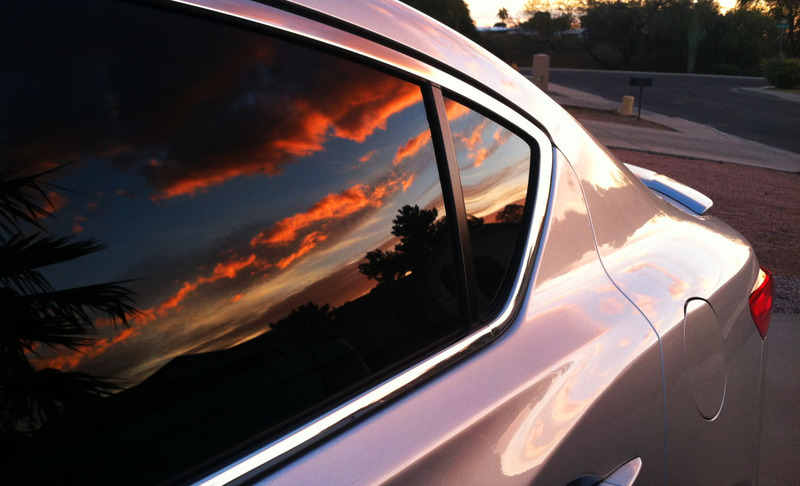 325i: Sometime in 2011, the BMW lost a headlight in a late summer monsoon thunderstorm. The interior has deteriorated so badly it’s difficult to tell what color the seats used to be; they’re currently a brownish hue and appear almost as if they’ve been burned. Seat control mechanisms failed in 2012 so the front seats are fully reclined. One windshield sun visor has been lost. Taillights have faded considerably. Dust/wind storms frequently blow the driver’s door open. 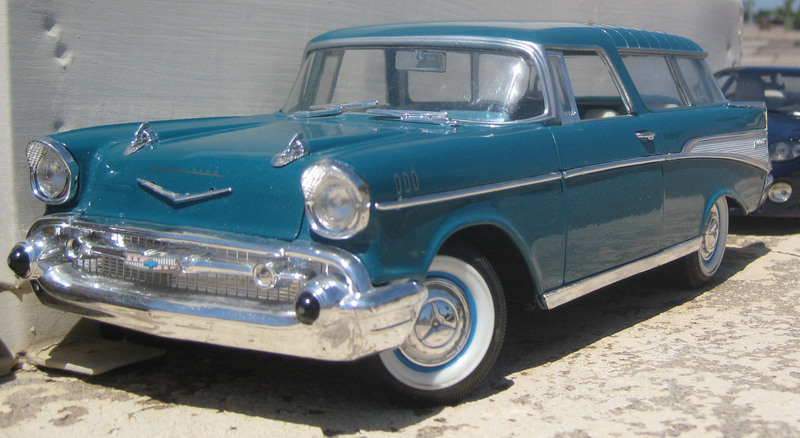 Nomad: Despite having the advantage of afternoon shade, the Nomad’s paint has perhaps fared the worst. Horizontal surfaces developed cracks within the first year. Plastic trim yellowed and the chrome lost its luster shortly thereafter. However, the Nomad has been steadfast in its body rigidity. 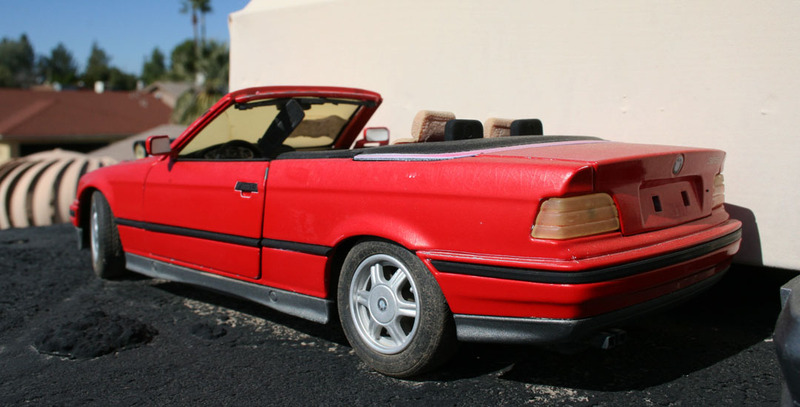 High wind gusts have never opened its doors, unlike with the imports, BMW and Mercedes. Thunderbird: The interior of the Thunderbird has collected a great deal of debris. It’s full of needles and dust. The engine bay has done a poor job of insulating its 4.8 liter V8 from the elements of nature. 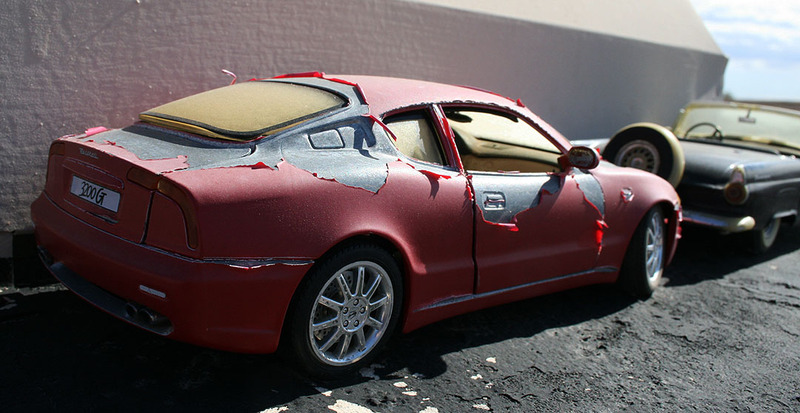 It would take a great deal of restoration work to clean things up and make it road-worthy once more. 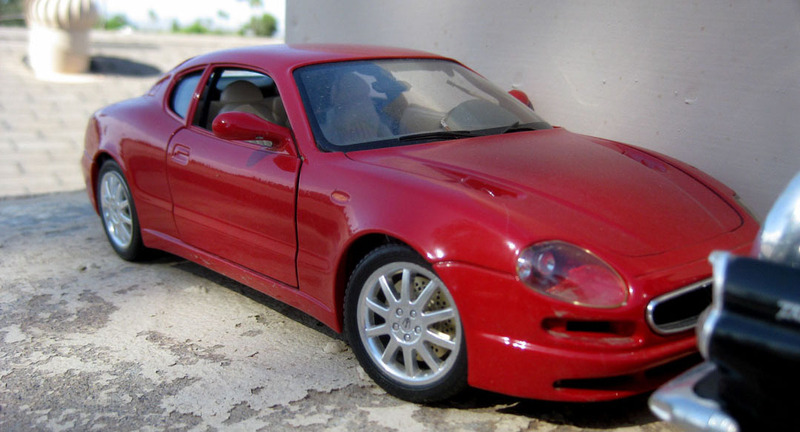 3200GT: This Italian is ready for the junkyard. The paint transitioned from red to pink and then started chipping off in large sections. Within a couple of months of project onset, the headlight seals had failed and allowed dirt inside. By Fall 2013, a headlight lens had broken open entirely. 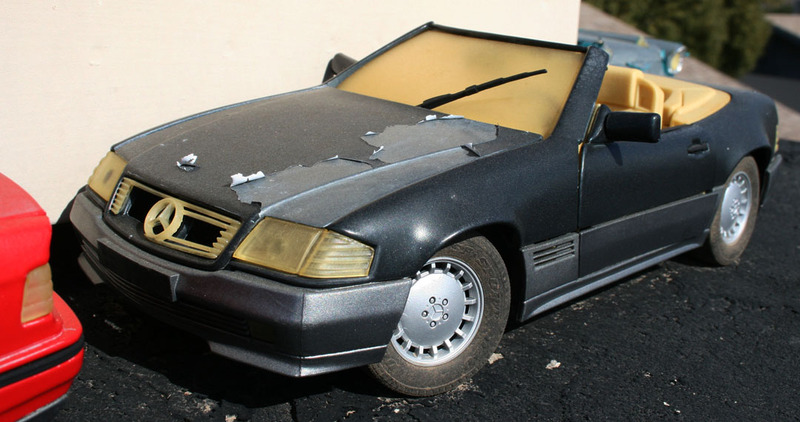 500SL: The Benz’s light colored interior was a wise choice by the design team, since it shows remarkably little wear. Exterior trim has developed many issues, including broken grille slats, a warped wiper blade, and lower body cladding that is separating from the body itself. 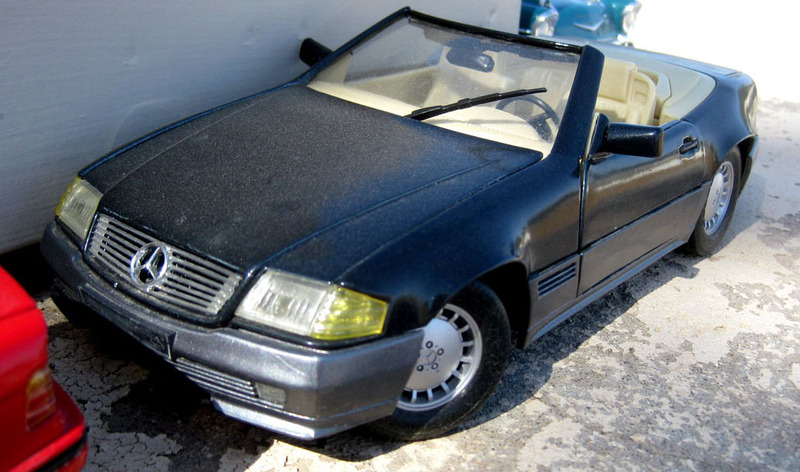 Since my friend Tyler asked for a model car update, this post is directed to him specifically. So there you go. Tyler, further updates will follow as requested :). Just go make today’s post educational, everyone’s homework is to watch this 12-minute YouTube video describing how to shift a 13-speed manual transmission. I find it fascinating. Gotta drive one! 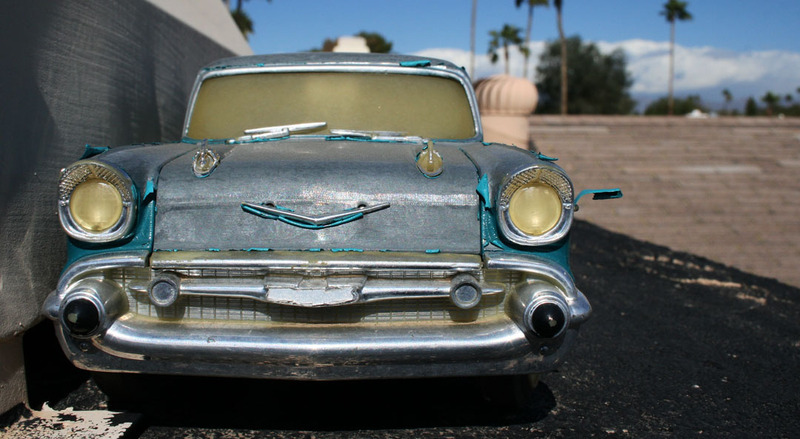 This entry was posted on February 5, 2014 at 5:07 pm and is filed under Arizona, Model Cars. You can follow any responses to this entry through the RSS 2.0 feed. You can leave a response, or trackback from your own site. Conclusion…red does not do well. Black is a close 2nd. My GS rolled 230,000 this morning. Almost broken in. Congrats Duane! The Sirius White GS 6-speed chugs onward. Maybe I should ride up that way so I can be in the passenger seat for your 1/4 million milestone. I am glad I did not get a red 2005 TSX. I almost did. I wanted a red one with a black interior. Got a white one instead and the paint has fared very well over the last 9 years even with my car constantly in the harsh Florida elements. I do not have a garage. Haha, I wouldn’t dream of stepping anywhere NEAR my friends’ cars with a bottle of saltwater. I have seen a few early TSXs on the road with Milano Red and unfortunately they’ve faded to pink. I think you made a wise choice with the white since your car sits outside all the time. Send me some current pics of that beauty! Haha, I know. It’s really sad when you see a somewhat new car that has severely oxidized paint. The thing that’s funny is noticing that the plastic headlights on these model cars get yellow just like they do on real cars. Maybe some Meguiars Plast-X would do the trick. I really enjoy getting back to this experiment! Thanks for the updates Tyson. Haha, don’t tempt me into somehow subjecting a real car to a similar experiment! 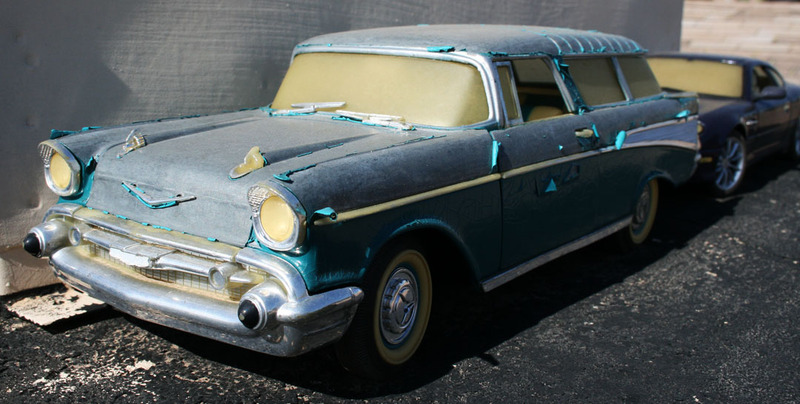 Though, I’ve seen plenty of near-new vehicles in Arizona that get severely oxidized in a short matter of time when left outdoors all the time. Desert takes its toll!